ANTIMICROBIAL ACTIVITY OF PHOTODYNAMIC THERAPY AGAINST MICROORGANISMS ISOLATED FROM DEEP CARIOUS LESIONS. Violeta Dogandzhiyska1 , Raina Gergova2, Slavcho Dimitrov3, Maya Doychinova3. 3) Department of Conservative Dentistry, Faculty of Dental Medicine, Medical University, Varna, Bulgaria. Introduction: Photodynamic therapy (PDT) is an innovative method, supporting routine treatment methods and accelerating the healing process. It is a method for treatment of pathogens and tumor cells with photoactive dye, in the presence of oxygen. PDT is minimally invasive and high- selective method against specific cells and is equally effective against sensitive and resistant to antibiotics microorganisms. Aim: The purpose of this study was to determine the antimicrobial activity of the PDT (Fotosan-Agent High) against microorganisms isolated from deep carious lesions. The samples were placed in eppendorf tube with standard transport medium and transported to the microbiological laboratory for determination of microbial number and identification of the isolated microorganisms. The statistical analysis was made with non- parametric test of` McNemar. Results: In 82.35% of cases (14 of 17 cases) after treatment bacteriаl infection was totally eliminated. In 17.65% (3 of 17 cases) was determined reduction of bacteria count from 100 to 1000 times. The statistical analysis with non- parametric test of` McNemar presented significantly higher proportion of cases with bacterial elimination after photodynamic therapy ( p < 0.001). Conclusion: After photodynamic desinfection were determined considerable elimination of microbial infection and reduction of bacterial variety and bacterial number. On the ground of these results it can be concluded, that photodynamic therapy is an effective method of treatment and removal of microorganisms from deep carious lesions and support the healing processes in the dentin and dental pulp. Dogandzhiyska V, Gergova R, Dimitrov S, Doychinova M. Antimicrobial activity of Photodynamic therapy against microorganisms isolated from deep carious lesions. J of IMAB. 2013 Jul-Dec;19(4):430-434. doi: 10.5272/jimab.2013194.430. 9. Mang TS. Lasers and light sources for PDT: past, present and future. Photodiagnosis and Photodynamic Therapy. 2004; 1:43-48. 13. Di Poto A, Sbarra MS, Provenza G, Visai L, Speziale P. The effect of photodynamic treatment combined with antibiotic action or host defence mechanisms on Staphylococcus aureus biofilms. Biomaterials. 2009; 30:3158–3166. 14. Santini A. The Management of the Deep Carious Lesion and Maintenance of Pulp Vitality (II). Restorative Dentistry. 1980 Apr: p. 6. 15. Smith EG., GA. Spatafora. Gene Regulation in S. mutans: Complex Control in a Complex Environment. J Dent Res. 2012; 91(2):133-141. 16. 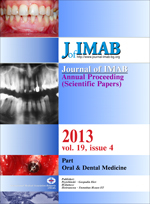 Todea C, Kerezsi C, Balabuc C, Calniceanu M, Filip L. Pulp Capping – from Conventional to Laser-assisted Therapy (I). J Oral Laser Application. 2008; 8: 71-82. 17. Todea C, Kerezsi C, Balabuc C, Calniceanu M, Filip L. Pulp Capping – from Conventional to Laser-assisted Therapy (II). J Oral Laser Application. 2008; 8: 147-155. ].